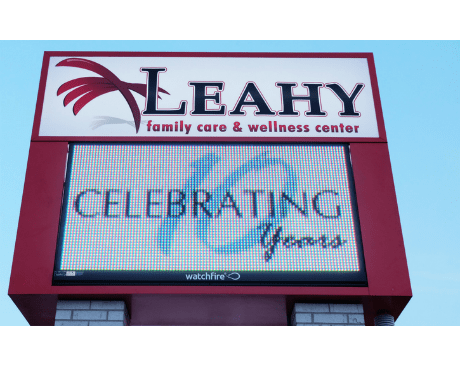 Leahy Family Care & Wellness Center is a comprehensive medical practice, located in Lima, Ohio and serving patients in the surrounding Allen County areas. Designed to be a one-stop-shop to wellness, the practice is independently owned and operated by Dr. William Leahy. Dr. Leahy is a top-ranked family medicine physician and has been serving local residents for over 15 years. At Leahy Family Care & Wellness Center, all of your family’s health needs can be met at one central location, without the uncomfortable first visits or the need to research new specialists for every health need. Services include Juvederm®, Botox®, microdermabrasion, SculpSure® body contouring, personal training, hormone replacement therapy, custom airbrush tanning, family medicine, and much more. The facility has everything you need for complete health and wellness. Broken down into 3 separate suites, Dr. Leahy offers a complete medical and wellness center to cater to almost all of your medical and health needs with a focus on caring for the whole body. Dr. Leahy and his staff provide each patient with personalized treatment options and care plans designed to meet their needs. He encourages patients living in the vicinity of Leahy Family Care & Wellness Center to call and make an appointment if they have questions about their health and well-being.